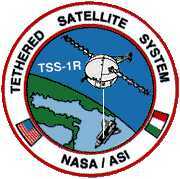 The primary objective of STS-75 is to carry the Tethered Satellite System Reflight (TSS-1R) into orbit and to deploy it spaceward on a conducting ether. The mission will also fly the United States Micro-gravity Payload (USMP-3) designed to investigate materials science and condensed matter physics. 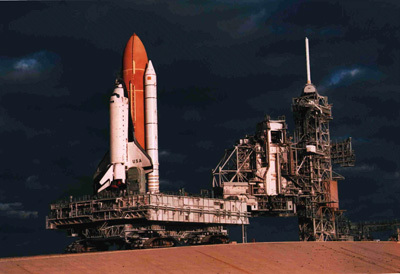 The TSS-1R mission is a reflight of TSS-1 which was flown onboard Atlantis on STS-46 in 1992. During that flight, the tether was deployed a distance of 860 feet. 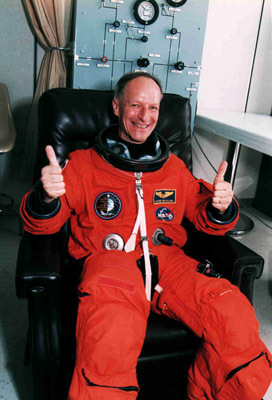 STS-75 mission scientist hope to deploy the tether to a distance of over 12 miles (20.7km). The Tether Satellite System will circle the Earth at an altitude of 296km which will place the tether system within the rarefied electrically charged layer of the atmosphere known as the ionosphere. The conducting tether will generate high voltage and electrical currents as it moves through the ionosphere across the magnetic field lines of the earth. Scientists will be able to learn more about the electrodynamics of a conducting tether system to deepen our understanding of physical processes in the near-Earth space environment. These studies will help provide explanations for events such as the formation and behavior of comet tails and bursts of radio "noise" detected from other planets. The specific TSS1-R mission objectives are: characterize the current-voltage response of the TSS-orbiter system, characterize the satellites high-voltage sheath structure and current collection process, demonstrate electric power generation, verify tether control laws and basic tether dynamics, demonstrate the effect of neutral gas on the plasma sheath and current collection, characterize the TSS radio frequency and plasma wave emissions and characterize the TSS dynamic-electrodynamic coupling. 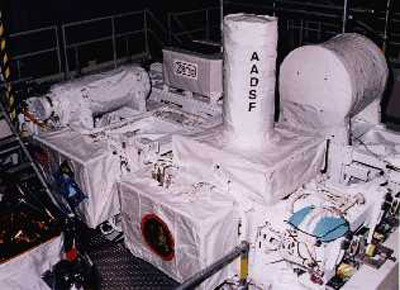 USMP-3 consists of four major experiments mounted on two Mission Peculiar Experiment Support Structures (MPESS) and three Shuttle Middeck experiments. The experiments are: Advanced Automated Directional Solidification Furnace (AADSF), Material pour l'Etude des Phenomenes Interessant la Solidification sur Terre et en Orbite (MEPHISTO), Space Acceleration Measurement System (SAMS), Orbital Acceleration Research Experiment (OARE), Critical Fluid Light Scattering Experiment (ZENO) and Isothermal Dendritic Growth Experiment (IDGE). February 22, 1996 3:18:00.061 pm EST. Launch window was 2 hours 30 min. There were no unscheduled holds. Winds at liftoff were from approximately 63.4 degrees at 5.76 knots. Ambient temperature was 72.8 F, barometric pressure was 29.94in Hg and relative humidity was at 78%. 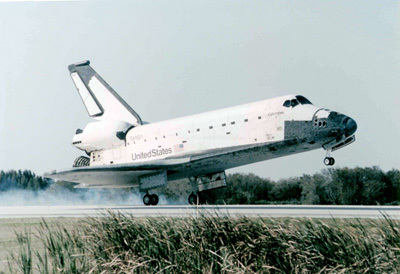 KSC Saturday, March 9, 1996 at 8:58:38 a.m EST, SLF Runway 33.The first KSC landing opportunity was waived off due to cloud cover at KSC. 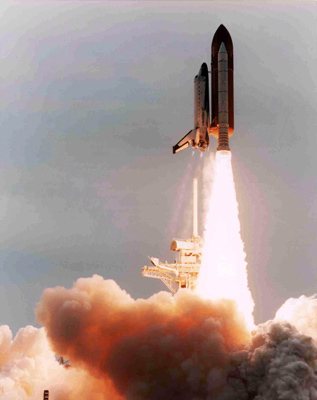 Day 1 About four seconds after liftoff, Allen reported that his instruments showed that one of the shuttle main engines was operating at only 45% of its normal power level. Flight controllers in Houston quickly responded that all engines were performing nominally. The engines throttled as expected about 1 minute into the launch, and operated normally all the way to main engine cutoff at 8 and a half minutes into the flight. Engineers will look at data from the launch to try to understand the faulty reading. 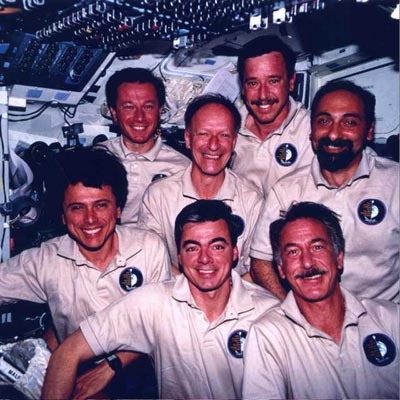 The seven-member crew got a go for orbit operations and opened the payload bay doors. 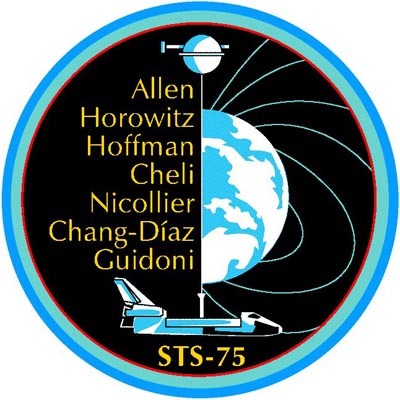 Nicollier and Chang-Diaz began activating the support equipment for the TSS. 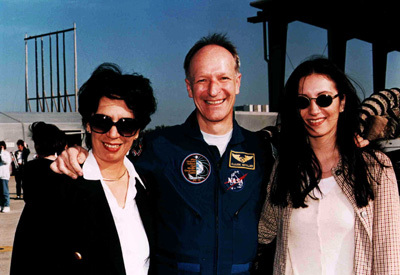 One of the unique features of this mission is that the crew is working in three staggered shifts instead of the normal two. This allows to operate a suite of instruments designed to gather real-world information about how conducting tethers might be used to generate electrical power for spacecraft and to learn to control tethers in space. 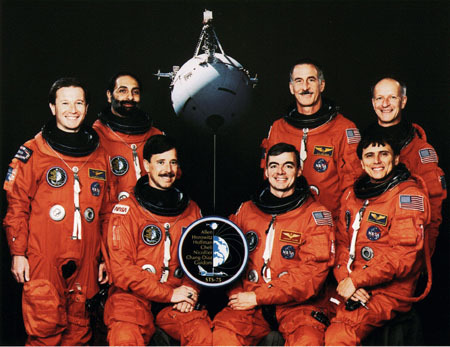 Day 2 Setting up shop was the order of business aboard Columbia overnight and early Friday as the seven astronauts split into three shifts to support the many experiments scheduled throughout the 14-day mission. 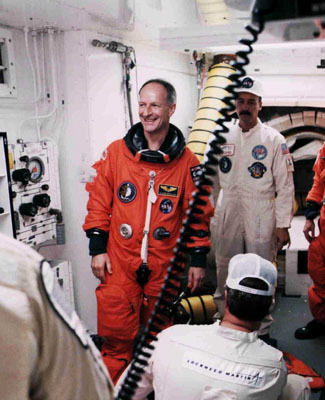 Following the successful power-up, science teams at Marshall's Spacelab Mission Operations Control Center began remotely monitoring and interacting with the USMP-3 experiments. Guidoni and Hoffman changed out the Data Display and Control System (DDCS), a laptop computer that graphically displays TSS data, because it was operating at a low performance level. The backup computer was successfully booted, but readings showed that it also was operating sluggishly. Since the smartflex and DDCS computers are linked, flight controllers are checking to see if these problems may be related. When activated, the computer gave normal readings except for tether length. A reading of 76 feet (23 meters) was shown when it should have been zero. The system was later reset to zero and the computer responded correctly. Day 3 Troubleshooting a balky experiment data relay box was done - the crew and flight control team slowly activated several experiments individually at first and then together trying to isolate the problem. Meanwhile, Nicollier took video of Earth's horizon using the Tether Optical Phenomena (TOP) equipment. Day 4 The crew began deployment " by activating small tether-aligned thrusters mounted on the satellite. It will take about 5.5 hours for the tether to fully extend above the Shuttle. Although not yet fully deployed, voltage is already being created across the copper-cored tether, and current is flowing through the tethered system. TSS Deployer Core Equipment (DCORE) Principal Investigator Dr. Carlo Bonifazi, of the Italian Space Agency, reported that the DCORE successfully completed the first performance run at about a 3.8 mile (6 kilometer) tether length, generating a current of 195 milliamps, a level 97 times greater than the level obtained during the TSS-1 mission. As the satellite was nearing the full extent of its deployment from the Shuttle, the tether broke about 7:30 p.m. CST Sunday. The satellite immediately began accelerating away from Columbia at a rapid rate as a result of normal orbital forces. TSS is separating from Columbia at a rate of 420 miles each 90 minute orbit. The tether apparently snapped near the top of the 39-foot TSS boom in Columbia's cargo bay. 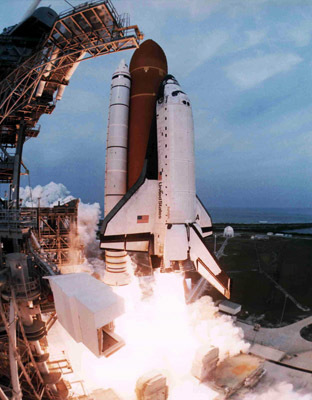 Neither the astronauts nor the Space Shuttle were ever in any danger. 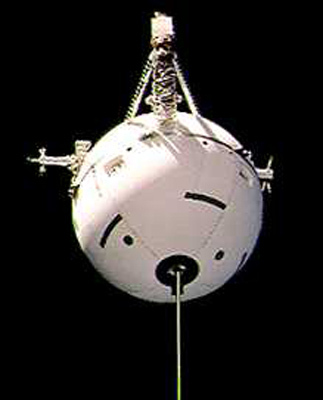 Mission Control asked the astronauts to record television of the boom and broken tether for post-flight analysis. Flight controllers now will be determining when and how to secure the TSS support equipment, including the deployment boom, before moving on with other mission objectives. Scientists and engineers managed to gather about five hours of data on the performance of the satellite and tether dynamics before the break. Tether voltages of as high as 3,500 volts were developed across the tether, and current levels of approximately 480 milliamps, or nearly half an amp were achieved, giving the science teams an indication of results surpassing expectations. Day 5 The astronauts reeled back the remaining length of tether and stowed the mast for the TSS. The crew and flight control teams spent much of the day putting TSS equipment in a safely stowed condition and preparing for experiment operations with the U.S. Microgravity Payload. Day 7 Half of the crew enjoyed a half day of free time as is customary on two-week long shuttle flights. During the break, Horowitz, Cheli and Guidoni discussed the flight with the C-SPAN network and answered questions from viewers. Meanwhile, science teams for the TSS demonstrated their own brand of telescience throughout the night, commanding and receiving data from their reactivated instruments on the satellite. The ROPE, RETE and TEMAG experiments continue to collect data about the satellite's interaction with its surrounding region of charged particles and magnetic fields. NASA managers decided today not to return Columbia to the TSS for either a close inspection or a possible retrieval after concluding that propellant margins would not be adequate to support the operations. The satellite is currently 7,100 nautical miles ahead of Columbia. Day 8 Horowitz and Nicollier performed runs of the Lewis Research Center-managed FFFT experiment in the Middeck Glovebox Facility. They burned flat paper samples to help the science team study how air motion affects flame spreading in microgravity. Day 9 Allen, Cheli and Guidoni accepted a congratulatory phone call from Giorgio Salvini, the Italian Minister of Universities and Scientific Research. Day 10 AADSF finished processing the first of three lead-tin- telluride samples. 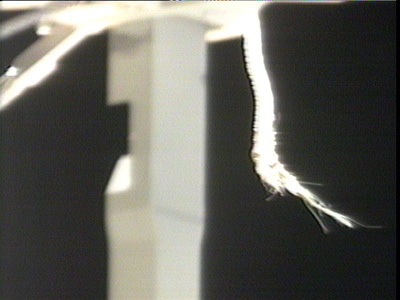 Day 11 Crew members worked with an experiment called the Forced Flow Flamespreading Test which studies how flames react in the absence of gravity. Day 12 Columbia's astronauts will spend an additional day in orbit to support ongoing scientific investigations with the United States Microgravity Payload. Day 13 The astronauts took time out from science operations to discuss the progress of the mission with reporters in the United States and Europe. Chang-Diaz, Hoffman and Nicollier participated in an interview with both Univision and Telenoticias, the two largest Hispanic television networks. Day 14 The extra day will give the MEPHISTO science team an unexpected opportunity to test critical theories about materials solidification in a way that cannot be done on Earth. 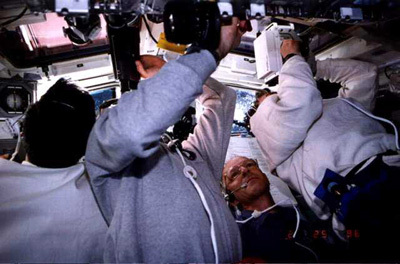 Day 15 Crew members prepared the Middeck Glovebox for landing. Day 16 Today's landing opportunities slipped by one by one as the flight control team saw some improve-ment in cloud cover at the KSC landing site, only to be faced with a prediction of bands of low clouds moving over the runway area at the scheduled landing time. Day 17 Columbia landed at 7:58 a.m. CST at the KSC. An earlier landing opportunity was waived because of clouds, but weather conditions improved for the one-orbit later end of mission. The crew will return to Houston to a welcoming ceremony at Ellington Field Saturday mid-afternoon.